The most important activity you need to engage in today is prayer. Writing on the importance of prayer in his first letter to the Thessalonians Paul penned, “Never stop praying.” I don’t think Paul means we need to pray non-stop 24/7 I think what he means is contained in chapter 4 Philippians. My own experience with prayer has taught me: Out of our prayers come our experiences with God. That doesn’t mean each time we bow our heads and pray we are suddenly going to find ourselves enveloped in a mountain top experience with God. However, what it does mean is through the Holy Spirit God is present with us and it is God’s presence that is the answer to our prayers. There’s an important component of prayer that is often overlooked the component of prayer I am talking about is trust; trust that God will do what is right. Trust is that component of prayer that opens us up to God’s Peace. Trust is that component of prayer that assures us that with our “Amen” we can know that the work of God has just begun and God will see it to the end. 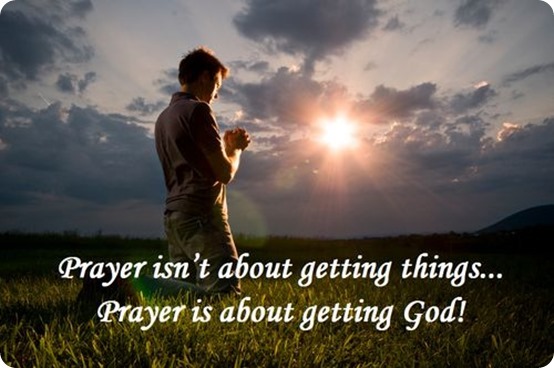 Prayer isn’t about getting things – Prayer is about getting God!